The Art and Culture Program at Denver International Airport (DIA) presents its newest temporary art exhibition, The Magic of Glass. The exhibition opens April 24 and will be on display through August in Ansbacher Hall, the main walkway which connects Jeppesen Terminal to A Gates. The Magic of Glass includes more than 60 glass objects and also educates airport visitors about various glass-making techniques and processes. The exhibit is a display of fine contemporary glass art by 31 local, national and international artists who were selected based on their expertise and experience working with the medium. Their distinctive styles and diverse talents illustrate the various aesthetic possibilities of this art form and the vast number of techniques used to create these extraordinary works of art. This exhibition was curated in partnership with PISMO Fine Art Glass in Denver. PISMO Fine Art Glass opened its doors in 1990 and is the premier glass art gallery in Colorado. 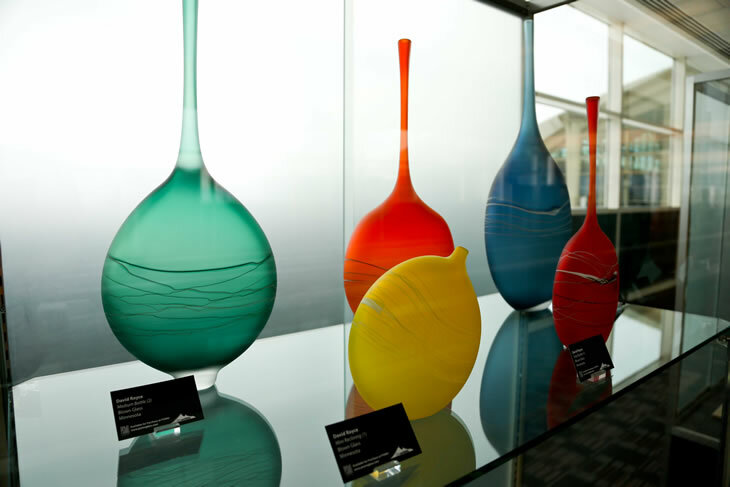 PISMO offers an extensive collection of contemporary glass art by world-renowned artists including Lino Tagliapietra, Dale Chihuly, and Dante Marioni. The gallery has locations in Denver, Vail and Aspen. Visit pismoglass.com for more information.